Located about 5 km from Queenstown on the Dordrecht road. It is one of the town’s main sources of water supply. The all-concrete arch-gravity wall was begun in 1905 and completed in 1908. It is of the earliest where formwork, rather than the traditional stonework, formed the facings, and was for years the largest concrete dam wall in South Africa. 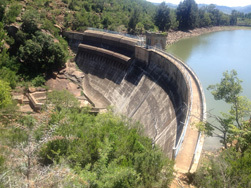 In 1934 it was raised by 1,22 m and provided with three syphon spillways. Incidentally the origin of the name Bongolo has been cause for some controversy, but it is believed by some to have been derived from the Xhosa word mbongolo meaning donkey, as these animals were extensively used in the construction of the dam.